Want to get some bathroom tips and hints? Read through then! Your bathroom has the potential to be one of the most beautiful rooms in your home. And it must be functional. A great bathroom can go a long way to selling a house – and it’s not difficult to update your old bathroom and create something that stands out. So here are our top 7 tips. Find inspiration in an array of places, for example: homes of people you know who have enviable bathrooms; interior design magazines and websites; chat with some professionals in bathroom building about what is trending in contemporary bathroom design. Look at a selection of suppliers to see a range of what’s available, and then narrow down your choice. Decide on the style and design of the bathroom you want. Do you dream about a chic vintage bathroom? Or the minimalist design is your best pick? Are you after a top-end bathroom or just a simple and functional one? Consider how much space you have, available natural light, and your budget. When planning the bathroom try and choose simple clean lines – let the finishes of your surfaces bring the impact to your bathroom design. Choose an overall neutral colour palette and have a feature panel for a pop of interest. This is a great solution to make your bathroom outstanding without investing too much. Add interest with a stylish mirror to your taste that complements the overall look of the bathroom. Mirrors are a must in a contemporary bathroom, just make sure it fits in really well. Keep vanity surfaces and shower recesses free of clutter for a more stylish look. It goes without saying that the less stuff on the vanity top and shelves, the more chances to enjoy the stylish area. One important thing to consider is your building products. It’s all about choosing the right products and professionals to fit-out your next bathroom – whether it’s for your home or for a commercial area. With so many options in the market, it’s really quite simple to achieve a stylish and expensive look of your bathroom. And it will be affordable and easy to care for. 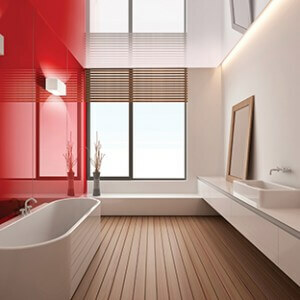 There are numerous innovative interior building materials: laminates and panels for vanities and cupboards, wet area panels for showers and bathroom walls, splashbacks panels, mirrors and other premium bathroom products. You are most certainly not limited to using somewhat boring and traditional tile! And make sure you explore the range of such brands as Zenolite and Wilsonart Laminates. Zenolite is a high quality yet very affordable alternative to glass and metallic panelling, providing a stylish and expensive appearance to vertical areas including walls in showers and alongside wet areas including bath tubs and above vanities. (It is also ideal for kitchen and laundry splashbacks). Designed and manufactured here in Australia, Zenolite is a high gloss, thermoplastic material that is rigid and very durable, providing a glass-like result. It is highly impact and scratch resistant, while maintenance and cleaning of it is effortless. Wilsonart Laminate is an ideal material choice for bathroom vanities. With a huge array of decor options, Wilsonart laminate offers unprecedented flexibility of design. The finishes and textures are extensive, some laminates have a look and feel of natural stone, woodgrain or plain colours would be great for cupboard doors, and all the combinations are only limited by your imagination. Visualise it, get the free samples and create the bathroom of your dreams. So now you know that for a modern and functional bathroom you should simply follow our top 7 bathroom tips, do a little research of the available solutions and follow your heart. Your dream bathroom is within your reach!